Doughnuts recipe by Fiza at DesiRecipes.com. In a double boiler over hot, but not boiling water, combine chocolate chips, butter and corn syrup. Stir until chips are melted and mixture is smooth, then add vanilla. Spread warm glaze over top of doughnuts, letting it drizzle down the sides. Seive the flour and salt together. Dissolove the yeast in the milk and water. Put 150gm flour and a tblsp of caster sugar in a bowl and add the dissoloved yeast to it. Mix to a smooth paste and leave to rise for 20 minutes. When the dough has risen, start incoroperating small pieces of dough by hand till all of it has been used up. Cut a larger rounds using a 1 to 1.5-inch cutter. Heat oil in pan and deep fry the doughnut holes until golden. 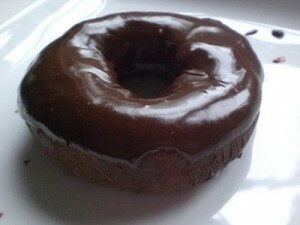 Then, after the doughnuts have been drained, drop them one by one into the chocolate glaze.